Mumbai: ‘In the heat of the 2004 US presidential race, John Kerry likened outsourcing to treason, Lou Dobbs harangued against it from his CNN anchor chair and the Indian outsourcing vendors were left scrambling. Engineers to the core, their leaders fired back with data-packed PowerPoint presentations. Outsourcing is good for the economy, they said; it increases efficiency; it creates more jobs than it costs. But in the eyes of many Americans, those arguments proved no match for vivid tales of laid-off software engineers. “Telling someone who loses their job in North Carolina or Jacksonville that this is good for the economy doesn’t work," said Phiroz Vandrevala, an executive vice-president at Tata Consultancy Services Ltd (TCS), one of the largest Indian vendors, who serves as an in-house Washington strategist for the Tata group firm and other Indian companies. But if four years is a lifetime in Washington, it is an eternity in Bangalore. They have hired a former top official in President George W. Bush’s administration as a lobbyist. They are humanizing the issue by bringing real-life Americans they have hired into meetings with politicians. They work with research firms, such as The Brookings Institution, to generate sympathetic research. They host cocktail hours on Capitol Hill. They have learned to play politics, urging members of Congress, whose districts benefit from trade with India, to support them on outsourcing. And most strikingly, they have mastered the Washington art of waging proxy battles through local front organizations, which spare them from appearing to be foreigners with an agenda. They provide facts, figures and arguments to trade groups such as the Information Technology Association of America (ITAA) and to Indian-American political groups. Then they watch as those groups arrange for seemingly neutral voices to champion their causes in the newspapers or before Congress. “The moment Nasscom says something, it is a vested interest," said Lakshmi Narayanan, the chairman of Nasscom, a trade group that represents the Indian outsourcing industry. “In the last few months," he said, Nasscom decided “to provide the data, work behind the scenes, but really to be fronted by the local organizations". The Indian companies are mounting this effort out of fear that the pressures of the US presidential election, and of the Democratic primary especially, will induce candidates to lash out at the Indian vendors. Their business model is a perpetual lightning rod—the companies carve out tasks from their American clients and perform them more cheaply back in India or other low-cost locations. The Indian vendors’ main worries are the Democratic candidates senator Barack Obama of Illinois, whose campaign has flirted with anti-outsourcing rhetoric, and John Edwards, the former North Carolina senator, who is running an explicitly populist campaign. The Indian executives believe that senator Hillary Rodham Clinton of New York, also a Democrat, is more sympathetic to their cause, but they are concerned that she would be compelled to match the others’ statements in a tight contest. Meanwhile, new Democratic majorities in Congress have swept into office on a wave of anti-free-trade rhetoric. To the Indian companies, a recent attempt in Congress to crack down on skilled-worker visas underscored that a storm is gathering. “People are trying to make it an issue again," said one Washington lobbyist who represents some of the Indian companies and spoke on the condition of anonymity because of her company rules. But if the anti-outsourcing movement rouses again, it will find itself jousting with a changed foe. The Indian vendors have in no way strayed from their belief that outsourcing benefits both India and the US. But they have found smoother ways to get the point across. Vandrevala, the TCS official who also works for Nasscom, described 2004 as “a fantastic learning experience". Nasscom has hired as its chief Washington lobbyist Robert Blackwill, a former senior White House adviser and US ambassador to India in the Bush administration. As the president of Barbour Griffith & Rogers International, an arm of one of the most powerful lobby shops in Washington, located three blocks from the White House, he is a heavy hitter on Capitol Hill. In the past year, Blackwill, the unnamed Washington lobbyist and the Indian firms’ own executives have, among them, met with members of the staff of more than 100 US representatives and senators, the Washington lobbyist said. 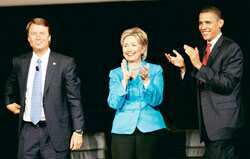 Executives from the Indian companies visiting the US, including on a trip organized by Nasscom in May, have met with aides to all the major presidential hopefuls, including Clinton, Obama, the former New York mayor Rudolph Giuliani and senator John McCain, Republican of Arizona, Vandrevala said. Several months ago, he said, Nasscom hosted an evening reception for members of the House of Representatives’ India caucus that drew 40-50 people. But the heart of the Indian vendors’ new strategy appears to be to remove themselves from the limelight. Outsourcing is not about us, goes the new Indian mantra to lawmakers: it benefits living, breathing Americans, including ones in your district. The Washington lobbyist said that a focus of the campaign was to collect data on Indian companies’ investments in the US, and then to lobby members of Congress from districts where those investments had created jobs. TCS, for example, may be funnelling some San Francisco-area technology jobs to India. But it belongs to an Indian conglomerate, Tata group, that recently acquired the Campton Place Hotel in San Francisco and thus, has hundreds of US workers on its payroll. The Indians have also begun to use their own customers, which include the largest US companies, as proxy soldiers. Both the vendors and the clients belong to trade groups such as ITAA, which help to coordinate lobbying campaigns in which an American chief executive will write a newspaper article or make a statement to Congress that is in his or her own company’s interest, but also benefits the Indian vendor. “We don’t want to be seen as very active there, because it can seem that India is trying to poke its nose into the debate," said Kiran Karnik, the president of Nasscom. “We would prefer that the active effort of working the Hill is done by US companies." A successful example of getting a heavyweight to help their case, according to the Indian companies, was recent congressional testimony by Bill Gates, the Microsoft Corp. chairman, in which he called vigorously for expanding the H-1B skilled-worker visa programme. While Microsoft does use the visas heavily, eight of the 10 largest H-1B applicants in 2006 were outsourcing vendors with their major operations in India. Indian-American political groups in the US are also effective proxies. The US-India Political Action Committee has defended outsourcing vendors, most of whose employees are in India, even though the group represents Indian-Americans living in America. In a profile of Clinton on the group’s website, it notes admiringly that “even though she was against outsourcing at the beginning of her political career, she has since changed her position". Narayanan, the Nasscom chairman, said: “Much of the difference between four years back and now is that many of the Indians who are influential, who are contributing, are in the technology industry. So clearly they are aligned with the cause." In a sign of their changing approach, the Indian vendors are also imitating a tactic used against them in the last election: putting a human, and preferably American, face on the issue. In meetings in Washington with members of Congress and with the presidential campaigns, the Indian companies are bringing in American employees they have hired locally. The employees typically serve as liaisons between the Indian firms’ American clients and their back-office workers in India, but to the Indians, they illustrate that outsourcing can also create American jobs. “Our opponents have been very good at spreading a lot of myths, and we have to counter that," said the Washington lobbyist. “And part of it is by putting an American face on it."